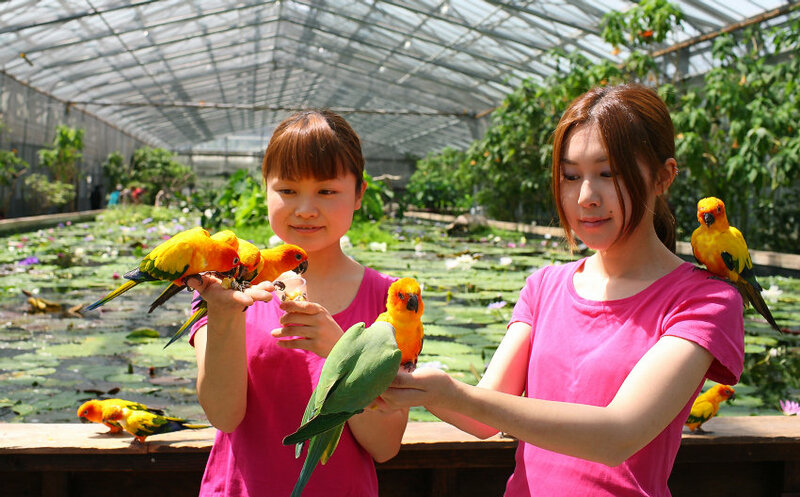 On April 14th, in order to prepare for posters and some other advertising items in summer, I took some pictures of people in short-sleeved clothes playing with birds. This issue focuses on some staff ladies in the Garden that worked as models in those pictures. 지난 4월14일,여름용 포스터에 사용하기 위해 한소데를 입고 새들과 놀고 있는 모습을 찍었습니다.오늘은 그 촬영모델로 되여준 여성스탭을 소개드리겠습니다. Ms. Matsumoto(left) and Ms. Goto(right), in charge of Parrots Handling Zone, in the Water Lily Pools Zone. 수련못에서 마쯔모도(좌)씨와 고또(우)씨.이 두분은 만남의 길의 담당입니다. 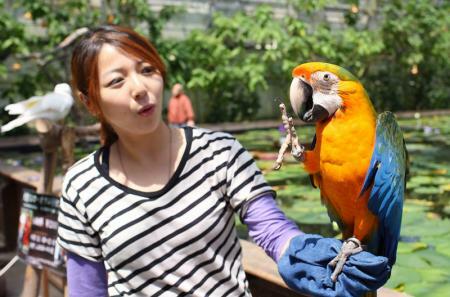 Ms. Matsumoto is also in charge of outdoor Macaws Show, and has narrated in ads of the Garden. Ms. Goto has often appeared in the weblog and pamphlets of the Garden. 마쯔모도씨는 실외의 금강앵무쇼를 담당하는 외에 당원의 CM나레이션 등도 담당하고 있습니다.고또씨도 지금까지의 블로그나 당원의 펨플렛 등에 여러번 등장하였습니다. We discussed in advance that they'd better wear T-shirts;they both sure did but, surprising to me, in stunning deep-pink T-shirts. 여름용사진이라 티셔츠를 입기로 약속했는데 두분 다 우연하게도 진한 핑크색의 티셔츠를 입었습니다. 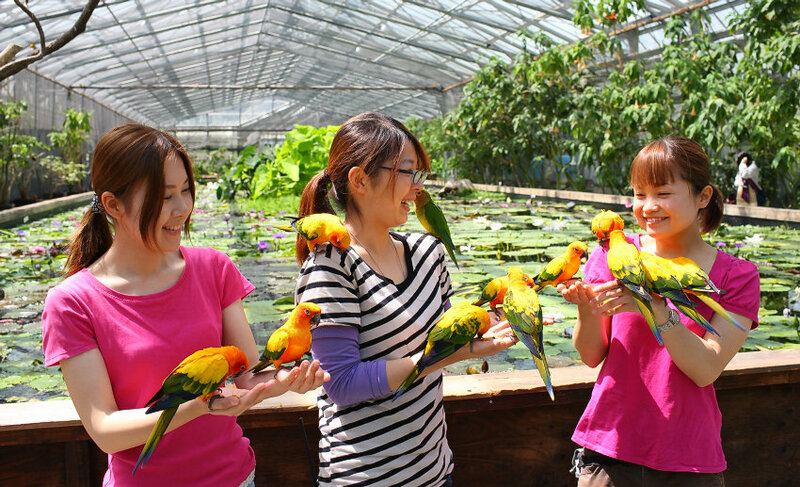 A shot of three, two shown above with Ms. Mizoguchi(centre), a plant staff member in charge of maintenance of Impatiens above the restaurant and other hanging baskets. 위의 두분과 가운데 식물스탭인 미조구찌씨의 사진입니다.미조구찌씨는 대온실의 플라워레스토랑의 임파첸스 등 화분의 멘테난스를 담당하고 있습니다. We had Haruka the Harlequin Macaw perched on the arm of Ms. Mizoguchi. It was her first experience, and she said that it was rather heavy. 미조구찌씨와 할리퀸금강앵무 하루카를 함께 찍었습니다.미조구찌씨는 하루카를 팔에 얹히는것이 처음이라고 하는데 생각보다 많이 무겁다고 하였습니다. 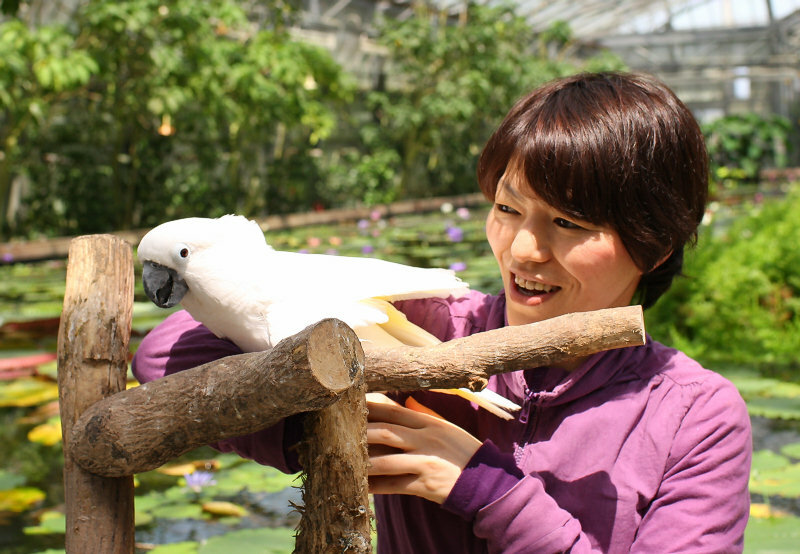 Tai the Umbrella Cockatoo and Ms. Arigaya, a cafeteria staff member but also in charge of planning and events, including Photograph Contest and summer posters under preparation this time. 흰 코커투 타이쨩과 아리가야씨.아리가야씨는 원내의 커피코너의 스탭인데 원내의 기획을 담당하고 있으며 매년 년말에 진행하는 카케가와화조원사진콘테스트의 표장식에서도 활약을 합니다.이번의 여름용포스터의 촬영도 그녀가 제기하였습니다.